An office Crosby Studios designed for NGRS in Moscow. 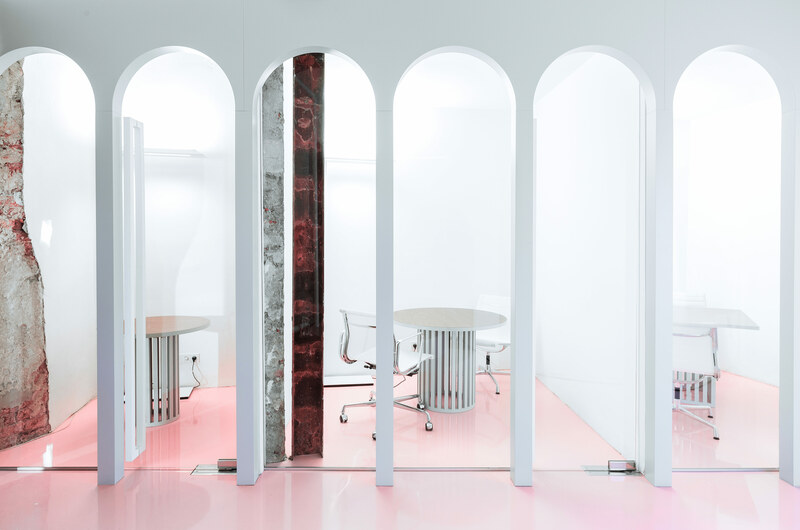 For a beauty parlor in Moscow, the studio kept the structure’s original 19th-century flooring intact, filling in areas with pink patches. The beauty parlor also features free-standing shelves designed by the studio. The bathroom of the beauty parlor by Crosby Studios. The Wood Box Apartment by Crosby Studios. The Black and White Apartment by Crosby Studios. Here comes the young designer, carrying his old chairs. For Harry Nuriev, who hails from the trading city of Stavropol in the North Caucasus and is now based in hyper-paced Moscow, staying grounded has been essential. It’s cost him some sweat and tears, but also helped forge his young studio. In just under two years, his practice, Crosby Studios—named for a flash of inspiration he had while walking along Manhattan’s Crosby Street—has completed commissions that include workspaces, cafes, and even penthouses.